"Yeah, I killed Dan. I killed all those people on that plane too. And now I'm gonna kill you." 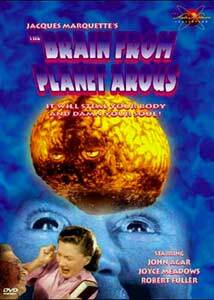 When I found out I was getting to review The Brain From Planet Arous, the title made me suspect I'd be getting something like Cat-women of the Moon that would be essentially goofy and poorly done. While goofy in concept, this film is actually pretty well done and a great deal of fun to boot. Perennial 1950s sci-fi hero John Agar stars as nuclear scientist Steve March. Along with his assistant Dan Murphy (Robert Fuller), he discovers radiation coming from the improbably-named Mystery Mountain (of course in actuality the ubiquitous Bronson Canyon). Upon investigation, they find a giant glowing, floating brain from the planet Arous (hence the title) that first kills Dan with a burst of radiation, and then possesses Steve in the first step of what the brain (named Gor) hopes will be the conquest of the world! Standing in the way is Steve's girlfriend Sally (Joyce Meadows), who realizes that something is wrong when Steve kisses her passionately upon his return! Soon Steve/Gor is on a rampage of destruction, blowing up airplanes, ruining atomic tests and blackmailing the leaders of the world. Can the brain be stopped without killing Steve? In addition to good old Atom Age paranoia combined with flying saucer hysteria, there is also a nifty current of sexual mania in the possessed Steve March, courtesy of the libidinous Gor. At one point, Gor even tells Steve, "We will take the young female for a ride in your car. I will enjoy being you tonight!" The amusing combination of the lusty brain with its planet whose name seems suspiciously like 'arousal' (and for the crowning touch is pronounced oddly similar to 'Eros') underlies this hotbed of sexuality that lies seething under the mild-mannered demeanor of the scientist, and brought to the fore by Gor. John Agar has a great deal of fun with this unusual villainous role, gleefully blowing things up with a glance of an eye and roasting numerous irritating personages alive. We thus get a happy dose of wish-fulfillment that brings the audience into uncomfortable league with Gor. The effects are limited to fairly primitive double exposures, but the design of the Gor brain is certainly unforgettable. It's hard to say that this is a good movie, but it's certainly entertaining in a delirious sort of way. My main complaint is that it's barely an hour in length and, without major extras, a little disappointing for content on a full-price DVD. Image Transfer Review: The original 1.33:1 picture is presented with a quite nice source print. There is minor speckling at the reel changes and a couple instances of frame damage, but overall the picture is beautiful. There is plenty of detail. In addition to nice rich blacks, there is a wide range of greys that look very attractive indeed. Audio Transfer Review: The mono soundtrack has the hiss and noise which is to be expected in a B-movie of this vintage. Music is a little tinny but not terrible. At all times, dialogue is quite clear. Extras Review: Other than a cornucopia of trailers (all but the one for the film proper are hidden as Easter eggs), there's nothing here. Production notes would have been nice, or something. This disc seems quite lacking for a full-price DVD; a drive-in double feature seems called for here. A must for lovers of 1950s sci-fi, this movie features a highly entertaining performance by John Agar that is sure to be appreciated by those he put to sleep in The Mole People and countless other such pictures. A very nice source print, but no extras and sadly short on content; this would have made a good half of a double-feature disc.